Plant taxonomy places red hot poker plants in the genus, Kniphofia. They go by other common plant names as well, including "tritoma" and "torch lily." Red hot poker plants are herbaceous perennials. In spite of their common name, "torch lily," they are not true lilies (i.e., they are not members of the Liliaceae family). 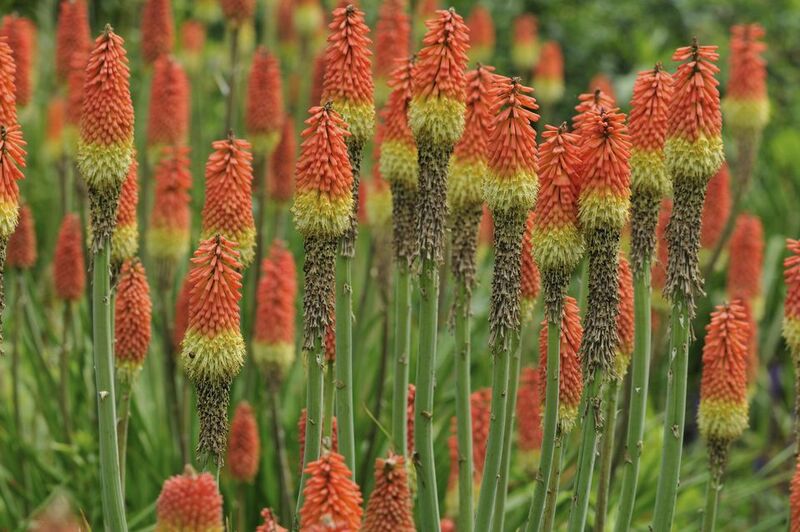 Terra Nova Nurseries has put out what they call a "Popsicle Series" of compact or "dwarf" red hot poker plants. As mentioned above, they include 'Pineapple Popsicle,' 'Mango Popsicle' and 'Redhot Popsicle.' The first produces yellow flowers on its flower stalks, while the second bears mango orange flowers. The third has what Terra Nova describes as a "cinnamon red" color. The Popsicle Series also offers dwarf torch lilies that are and two-toned. Except for floral color, these three dwarf torch lilies are very similar perennials. The grassy, clumping foliage reaches a height of about 1 to 2 feet, but when you add the flower stalk into the equation, these torch lilies will reach over 2 feet tall. The blooms lowest down on the flower stalk dry up and fade first, turning a pale brown. This fading then progresses up the rest of the stalk, until, finally, reaching the top, which is last to lose its color. Torch lily spreads over time via rhizomes, which suggests it has the potential to be an invasive plant in some areas. Indigenous to South Africa, torch lilies are listed for growing in planting zones 6 through 9 (but can be hardy as far north as zone 5, especially with good drainage and mulch). Grow in full sun and in soil that is well-drained. Tough perennials, poor drainage is one of the few things that will kill them. Provide humus for nutrients. They are heat-tolerant and drought-tolerant perennials. Red hot pokers make good edging plants and surely are striking enough and blossom long enough to serve as specimen plants. Their drought resistance makes them suitable for use in rock gardens, although, considering their vigor, only for expansive rock gardens. In regions where torch lilies exhibit a proclivity to spread readily, they may make good ground covers. Torch lilies attract hummingbirds and bees, and they also function as plants that attract butterflies. But rest assured that they are deer-resistant perennials, in case you're worried that Bambi may join the love-fest. Deadhead red hot pokers to encourage prolific flowering. For older clumps, reduce overcrowding by dividing in spring. Mulch for winter protection at the Northern end of the suggested growing range. Likewise, wait until spring to prune back the leaves drastically; they will furnish a bit of extra protection against the cold. But it is fine to remove a few unwanted leaves here or there throughout the growing season. Watch the flower stalk develop. Even when it first attains some significant height, the flowers are not yet open. Instead, they pop up as a network of tightly-packed beads at the tip of the flower stalk, which, at this stage, might remind you of a rattlesnake's tail. But what makes torch lilies so popular is their vibrant color, the spiky appearance of their flower stalks and the fact that they are long-blooming perennials. Because they're drought-tolerant, they could easily fit into a xeriscaping plan. Bemoaning how difficult it is to remember the spelling of the genus name, Allan Armitage, in Armitage's Garden Perennials, notes that Kniphofia ​was named "for German botanist J. H. Kniphof." Bougainvillea plants and poinsettias are other examples of plants that are named after people and that, unhappily, practically beg us to misspell them.